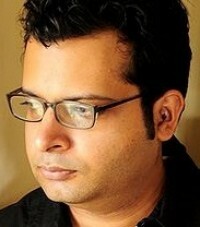 This is the 10th installment of The Rationalist, my column for the Times of India. 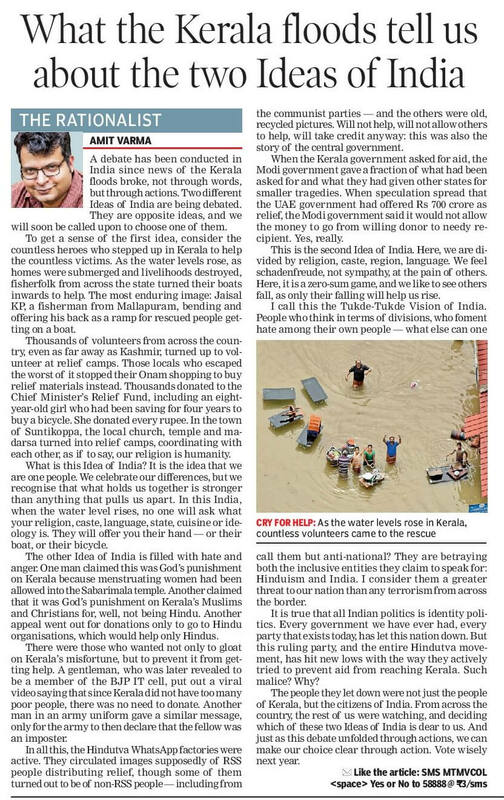 A debate has been conducted in India since the Kerala floods broke, not through words, but through actions. Two different Ideas of India are being debated. They are opposite ideas, and we will soon be called upon to choose one of them. To get a sense of the first idea, consider the countless heroes who stepped up in Kerala to help the countless victims. As the water levels rose, as homes were submerged and livelihoods destroyed, fisherfolk from across the state turned their boats inwards to help. The most enduring image: Jaisal KP, a fisherman from Mallapuram, bending and offering his back as a ramp for rescued people getting on a boat. Thousands of volunteers from across the country, even as far away as Kashmir, turned up to volunteer at relief camps. Those locals who escaped the worst of it stopped their Onam shopping to buy relief materials instead. Thousands donated to the Chief Minister’s Relief Fund, including an eight-year-girl who had been saving for four years to buy a bicycle. She donated every rupee. In the town of Suntikoppa, the local church, temple and madarsa turned into relief camps, coordinating with each other, as if to say, Our religion is humanity. What is this Idea of India? It is the idea that we are one people. We celebrate our differences, but we recognise that what holds us together is stronger than anything that pulls us apart. In this India, when the water level rises, no one will ask what your religion, caste, language, state, cuisine or ideology is. They will offer you their hand – or their boat, or their bicycle. The other Idea of India is filled with hate and anger. One man claimed this was God’s punishment on Kerala because menstruating women had been allowed into the Sabarimala temple. Another claimed that it was God’s punishment on Kerala’s Muslims and Christians for, well, not being Hindu. Another appeal went out for donations only to go to Hindu organisations, which would help only Hindus. There were those who wanted not only to gloat on Kerala’s misfortune, but to prevent it from getting help. A gentleman, who was later revealed to be a member of the BJP IT Cell, put out a viral video saying that since Kerala did not have too many poor people, there was no need to donate. Another man in an army uniform gave a similar message, only for the army to then declare that the fellow was an imposter. In all this, the Hindutva Whatsapp factories were active. They circulated images supposedly of RSS people distributing relief, though some of them turned out to be of non-RSS people – including from the communist parties – and the others were old, recycled pictures. Will not help, will not allow others to help, will take credit anyway: this was also the story of the central government. When the Kerala government asked for aid, the Narendra Modi government gave a pittance, a fraction of what had been asked for and what they had given other states for smaller tragedies. When speculation spread that the UAE government had offered Rs 700 crores as relief, the Modi government said it would not allow the money to go from willing donor to needy recipient. Yes, really. This is the second Idea of India. Here, we are divided by religion, caste, region, language. We feel schadenfreude, not sympathy, at the pain of others. Here, it is a zero-sum game, and we like to see others fall, as only their falling will help us rise. I call this the Tukde-Tukde Vision of India. People who think in terms of divisions, who foment hate among their own people—what else can one call them but anti-national? They are betraying both the inclusive entities they claim to speak for: Hinduism and India. I consider them a greater threat to our nation than any terrorism from across the border. It is true that all Indian politics is identity politics. Every government we have ever had, every party that exists today, has let this nation down. But this ruling party, and the entire Hindutva movement, has hit new lows with the way they actively tried to prevent aid from reaching Kerala. Such malice? Why? The people they let down were not just the people of Kerala, but the citizens of India. From across the country, the rest of us were watching, and deciding which of these two Ideas of India is dear to us. And just as this debate unfolded through actions, we can make our choice clear through action. Vote wisely next year.